With football season in full swing, I decided to sit down and look at NFL stadiums with the ultimate fan experiences. Whether it’s a unique fan amenity or a stadium rich with history, read on to see if your team’s home field made the list! One of the older stadiums on this list, Lambeau field was built in 1956. What lands the “Frozen Tundra” on our list? The classic design of the stadium means there’s theoretically no bad seat in the house. Renovated in 2003, the Packers home field now boasts a luxury seating section, fan atrium, and an 80 exhibit hall of fame. Opening in 2014, Levi’s Stadium features a tech savvy fan experience. The stadium allows for fans to order off concessions menus from the comfort of their phones, and have the food delivered to their seats — allowing fans to skip the lines and maximize game time. Opened in 2016, US Bank Stadium features a unique translucent roof — giving fans an outdoor experience while still shielding them from the cold. Turf suites allow fans to sit 25 feet from the playing field, and Vikings Voyage (an interactive fan experience) is sure to keep your kids entertained. Located in the “Buccaneers Cove” section of the stadium sits a massive pirate ship, equipped with cannons that fire every time the Buccaneers score. Talk about a unique fan experience! Offering a complete fan experience — and some of the best barbecue — the Chiefs’ home field is also noted as one of the loudest stadiums in the league. If you’ve ever wondering how much purchasing the stadium would cost as a “second home,” take a look at this article (hint, it’s valued at over $200 million). With an impressive view of the Seattle skyline and 70% covered seating, CenturyLink Field has some impressive features. In 2002 it was the first NFL stadium to install an artificial field. In 2013 fans broke the world record for loudest stadium in the world, due in part to the small area of the structure. Featuring a world-class contemporary art collection personally selected by owner Jerry Jones, the Cowboys stadium is also a museum. 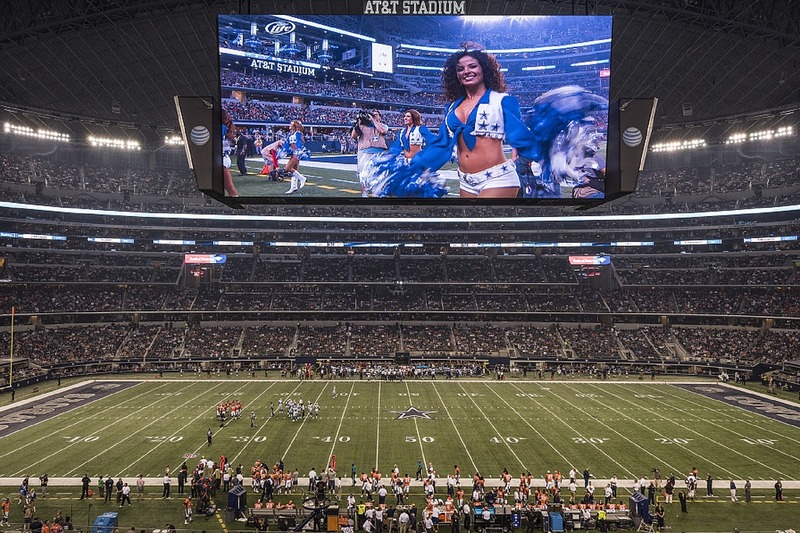 Boasting one of the most impressive jumbo screens in the league (each of the screens weighs 1.2 millions pounds), and seating 100,000 — everything really is bigger in Texas. The Dolphins 72 club is a luxurious seating section that features VIP parking, living room style seating, and extra leg room. Personal screens can be included for viewing highlights and replays. If a seat in club 72 isn’t in your budget, 92% of the stadium is shaded by a canopy, to keep you cool in the Florida heat. Completed in 2017, this brand new stadium claims the title for most unique appearance with its retractable roof. It also features a 3,200 foot “halo” video board, taking a different approach to the classic jumbotron. The Falcons’ stadium also features sideline suites, in case you wanted to get as close as possible to the action. While this stadium might not be the biggest or the loudest, it features a “party zone” with two wading pools, cabanas, and an excellent view of the field. Added in 2014, this fan zone is one of the most unique additions to an NFL stadium. They’ve also recently added a “pet paradise” tailgate zone inside the stadium, with a bone shaped pool for your furry friend to cool off in.